Do you know where your time goes to? Wondering where the time goes to? Do you feel you never have time for anything? We all have the same amount of time in any one week but some people seem to use it more effectively than others. If you are getting done what you need and have time for yourself, your family, your work and your hobbies, then you don’t need to read any further. If you wish you had more hours in the day to do everything that needs to get done, read on for some tips. If you are not using any of these, you could save yourself considerable time every day, to do what you really need or want to do. 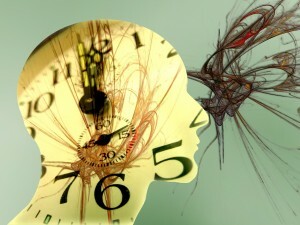 Do you know what’s happening to YOUR time? laugh – I am serious. Other people can be the biggest wasters of your time – IF YOU LET THEM! But first, you have to realise just where your time is disappearing to. time diary for a week or more. It only needs to be in a tiny notebook that you could carry in your bag or a pocket or keep on your phone or tablet. Divide each page into 2 columns. in one, write down the time. Try and do this every half hour, if you remember. Opposite this, in the other column, write down a couple of words on what you are doing. 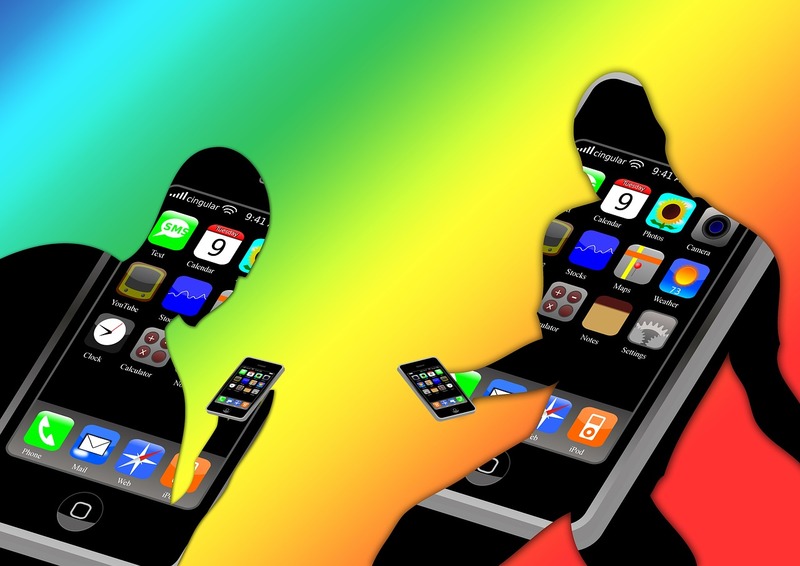 It might be internet surfing, playing games, doing housework, study, working, doing sport, etc. This will help you to understand how you presently spend your time and shed some light on what activities are non-productive and whether some activities are taking too long to do. It may also help you realise just how LITTLE time you are spending on the IMPORTANT things YOU have to do, whether that’s your business, a report you have to write, your housework, your study or your family or hobbies. 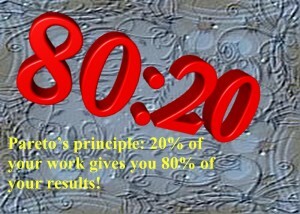 Have you heard of the 80:20 rule? Also known as Pareto’s Law, it says that 20% of the work you do produces 80% of your results. Think about that! Only 20%, that’s 1 phone call for every 5 made, or 12 minutes out of every hour, gives YOU 80%, that’s $4 out of every $5 you earn, or 8 out of every 10 marks you got in an exam. It also tells you that 20% of your employees provide 80% of your problems! But also that 20% of your employees bring in 80% of your profits – probably a different 20% but not necessarily! 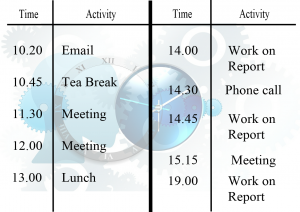 Look at your time diary (or the one above if you haven’t done one yet). It looks like this person needed to do a report but they didn’t get started on it until 2pm and they were still working on it at 7pm and maybe much later. Pareto’s law can also mean that 80% of the work you do (that’s 48 minutes in every hour), or 4 out of every 5 phone calls you make) will earn you only 20% of your income or marks. Vital Few or Trivial Many? That 80:20 rule means that among all the many trivial things you are doing, there are a few vital things you are doing too and it’s those VITAL FEW things you are doing that are bringing in most of your income (or marks or clean tidy house). If you are an Internet Marketer or an entrepreneur or business person or a student, think how much more you could do, or get, by finding that 20% and concentrating on that. What if you only worked on the IMPORTANT stuff? These are not the same. Something can be important but not urgent, such as sorting through your work files. Other things are both important AND urgent, such as the red oil light on your car or a pain in your chest. Try to work out what you’re doing in your time journal that is perhaps urgent but not important, or not even urgent, let along important, such as playing games or surfing the internet (if these are not part of your work). That’s enough theory – let’s find some practical tips that you can try. Try doing two things at once. This is NOT multitasking. For instance, you could listen to audio books while driving or walking. Combine 2 different journeys into one. For instance, reduce the number of times you go shopping in the week, by planning ahead for what you need, instead of getting stuff every day. This may seem like a contradiction to the tip above, but sometimes, we waste time by whining about what we have to do, instead of just doing it. Or we think about what we wish we were doing, instead of getting on with the chore. That means it takes longer. Whatever the task, washing dishes, cleaning the car, indexing files, counting stock, etc, focus on doing it well and quickly and then you can move onto something else. Sometimes, it’s easier to break the task up into bits. Do a bit, then rest a bit. If you’re at work and can’t “rest a bit”, then do a bit of another job. With study, you can use an outline to remind you what you need to write, then move between revising and writing. It all helps to keep your interest and keep you focused. What can you find about the job that is fun? Sometimes, it’s hard to find the fun in some jobs but for many jobs, there may be something you can find that’s fun and that will help motivate you to get the job done well as quickly as possible. What are your tips for improving time management or motivating yourself to get things done or even for getting rid of other people who are wasting YOUR precious time? If you want more tips to help you take control of your life, check back here, regularly. I am sorry I did not reply to your email from last June before now. You are welcome to add the time management article to your stress coach page if you still want to, provided you give me a link back to my site. Your web site looks very interesting and I would be happy to provide a link to it from my website if you wish. Thank you for commenting. No worries get back to me when your ready.